Carols - With the St. James Singers at 7:00PM. Christmas Eve Mass - At 7:30PM. Reception to follow in Upper Latta Hall. The Parish Annual Meeting - Will be held in January 17th, 2010. New Vestry Members - Will be elected at the Annual Parish Meeting, early in 2010. If you are interested in serving on the vestry, or just want to learn more about what the vestry does, see a member of the nomination committee or talk to Fr. Larry. Bishop Little's Annual Visitation - Will take place on January 3rd, 2010. The service will include confirmations/receptions for anyone eligible. There will be a carry-in brunch in Upper Latta Hall following the service. Please sign up in the narthex if you can help with the brunch. 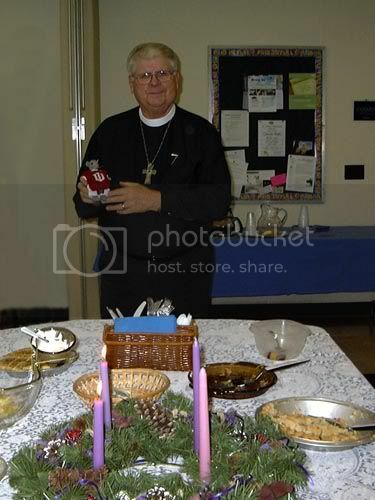 Bishop Little will meet with the vestry - At 9:30AM on January 3rd, 2010. January Lay Ministry Schedule - There are still several openings. Contact Katie in the Parish Office if you can help. Pledge Cards for 2010 - Are available in the narthex. There are still needs to be met in the upcoming year's budget. The vestry is urging everyone to prayerfully consider what they can contribute, then fill out a pledge card. Once your pledge card is completed you can place it in the collection plate or turn it in to the Parish Office. Ordo Calendars for 2010 - Are available at the church. The Ordo Calendar allows you to keep track of the church year and lists the lectionary for each day. These extremely useful calendars come to us courtesy of Reith, Rohrer & Ehret Funeral Home. Their gift is very much appreciated. Here is a list of some upcoming important dates to remember for 2010. January 3rd. Bishop Little's Annual Visit and Confirmation. January 17th. Parish Annual Meeting, following the 11:00AM service. January 31st. Snow Date for Annual Meeting. February 16th. Pancake Supper, 5:30 to 7:30PM. February 17th. Ash Wednesday Service, 6:00PM. March 28th. Palm Sunday, 11:00AM. April 1st. Maundy Thursday Service, 5:30PM. April 2nd. Good Friday Service, 12:00 Noon. April 4th. Easter Mass, 11:00AM. If you'd like a printed list of these dates they are available in the narthex. 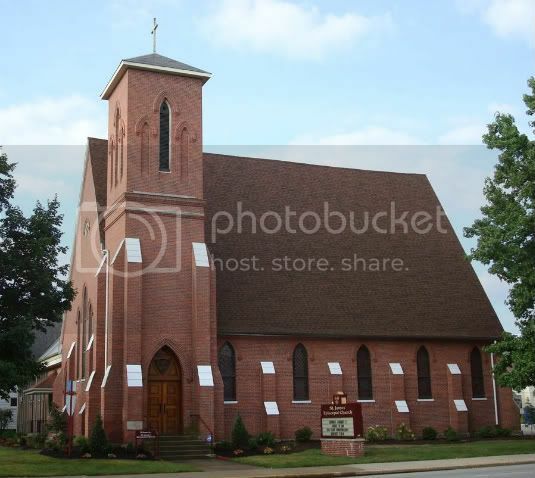 Welcome to the St. James' Episcopal Church schedule of events page. This is the place to find information about upcoming events, catch up on parish announcements, and view the lay ministry schedule. This page will be updated as frequently as possible. If you have any questions or problems, contact the parish office at 574-533-4984. Fr. Larry Biller at the celebration of the first anniversary of his ministry at St. James. Fr. 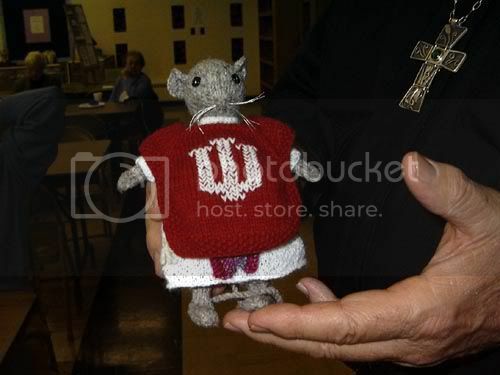 Larry shows off the "church mouse" made for him by parishoner Victoria Waters. Sunday December the 6th, 2009, was a special day at St. James. It has been one year since Father Larry Biller became our Parish Priest-in Charge. Parishoners celebrated the occasion with a special brunch and "card shower" following the service. Father Larry's ministry has been such a blessing to the parish that this truly was a very happy anniversary, and we hope for many happy returns. Nancy Snobarger - Is out of the hospital and is now recuperating at The Maples. She is currently in room 301, Bed A.
Cheeseball Sales - It will be necessary to make two more batches of cheeseballs. Dates are Dec. 7 & 14 for mixing and Dec. 9 & 16 for preparing. Cheeseball Salespeople - For this week: Thurs., Dec. 10 - Jackie McCormick; Friday, Dec. 11 - Rhoda Moriarty; Sat., Dec. 12 - Jody Kyle. December Lay Ministry Schedule - There are still several openings. Contact Katie in the Parish Office if you can help. Bishop Little's Annual Visitation - Will take place on January 3rd, 2010. The service will include confirmations/receptions for anyone eligible. There will be a carry-in brunch in Upper Latta Hall following the service. Christmas Eve Mass - Will be held December 24th at 7:30 PM. Sheets listing important dates to remember, as well as sign-up sheets for various services, can be found in the narthex.